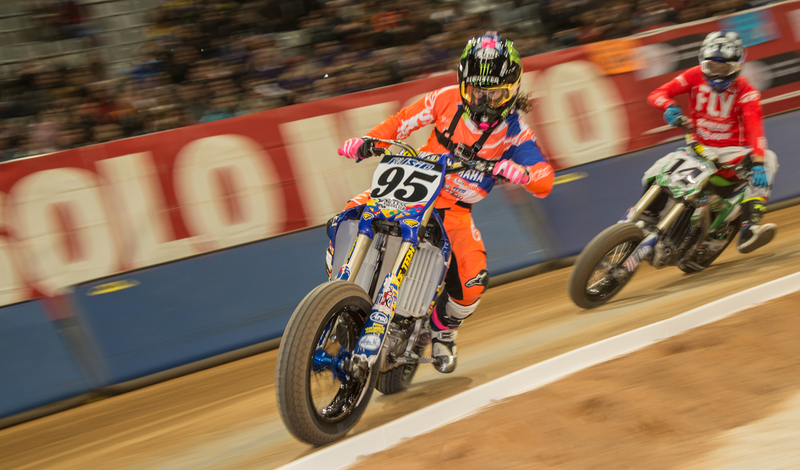 BARCELONA, Spain (Dec. 16, 2017) – It was another night of action-packed Superprestigio racing on the short track at the Palau Sant Jordi, and when it was all said and done, it was American J.D. Beach standing atop the victory podium. Standing alongside were fellow American Flat Track racers Briar Bauman and Ferran Cardus, finishing second and third, respectively, rounding out what was a riveting and dominant performance by the trio. It was a tough beginning to the day for Beach, as the No. 95 Ausio/Grau Racing Yamaha YZ450F rider had wheel and shock problems, requiring him to run a different set-up to what he’d ridden during his previous days in Spain. So it was all hands on deck from his team, fellow Americans and new friends in Spain. Beach not only rebounded from his rough beginning but absolutely shined in the finals, grabbing the Open Final win and then going on to take in dramatic fashion exactly what he flew to Barcelona for – the Superprestigio Final win for America. Beach’s fellow American had to rebound to make it a Team USA One-Two. The No. 14 Zanotti Kawasaki KX450F rider came together with Cardus at the start, but fought his way back to pass the Spanish Flat Track National Champion in the end and take second. It wasn’t exactly the result Bauman was hoping for, but he was happy to bring home a top result for the U.S. and enjoyed his first time overseas for his debut Superprestigio race. On the outside looking in was former Moto 2 World Champion/reigning MotoAmerica Superbike Toni Elias. The No. 24 Yoshimura Suzuki rider took top honors in the Superprestigio Class and got off to a great start, but fell victim to some good ol’ fashioned American-style short track racing, ultimately getting shuffled back to fourth. Completing the top five was Italian Fabio Di Giannantonio, a solid effort for the Moto3 rider on the No. 21 Zaeta.